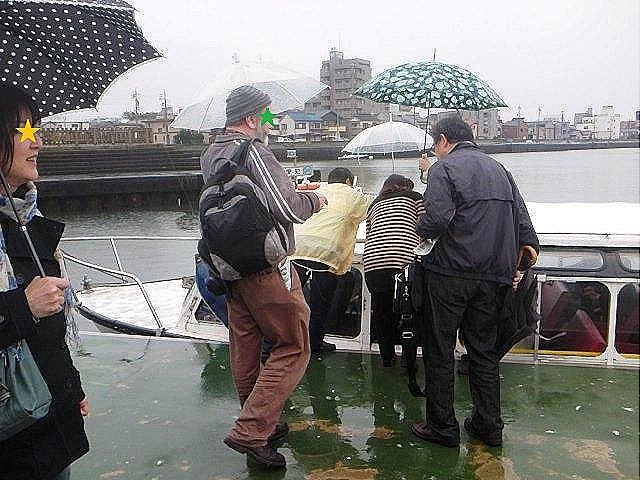 The tour participants were a group of about 40, and we boarded on a ship at Miya-no-watashi near Atsuta Shrine and disembarked at Naya-bashi between Nagoya Station and Fushimi Station. 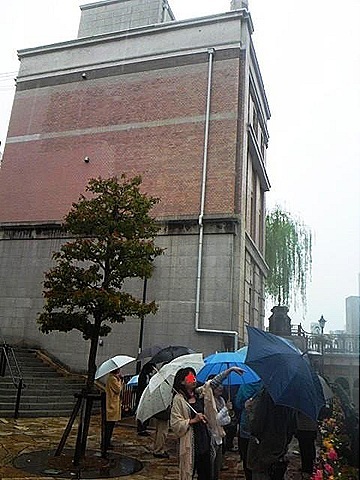 We once broke up the cruise tour once at Former Kato Shokai Building, which used to be the Thai Consulate and now is a cultural asset, and then about a half of us began taking a walking tour in the rain. Taeko didn’t join us. Actually, I thought to leave with her for a moment. But Hisako said cheerfully, “Why don’t you take part in the walking tour since we’re here?” So, I changed my mind and decided to walk when I saw her and the guide’s smiles. It was very nice for me to have taken part in the waking tour. That was much more interesting than the cruise. 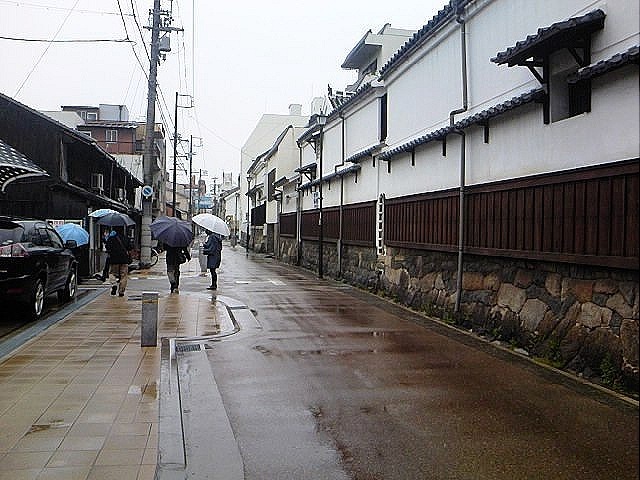 We left the old building and then began walk to the north along the town along the Horikawa River. 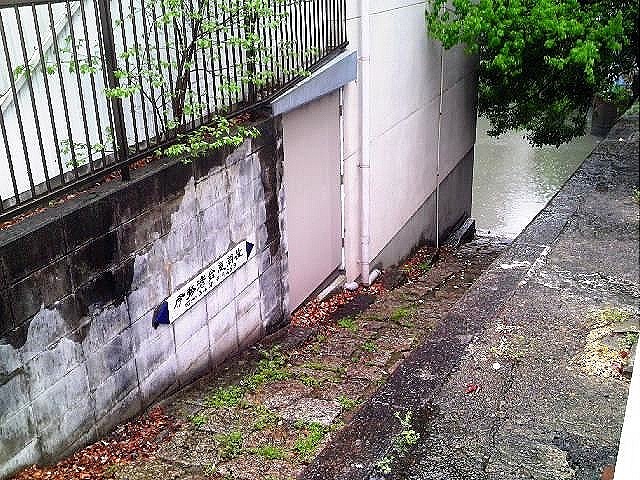 We found a sign which indicated the highest water level of the flood caused by the Ise Bay Typhoon in 1959 at Temma-bashi Bridge. Riverside areas possess elements of danger of floods. The indication must be good warning for people. While walking to the north for a while, we were suddenly welcomed by big trees and stone gate. 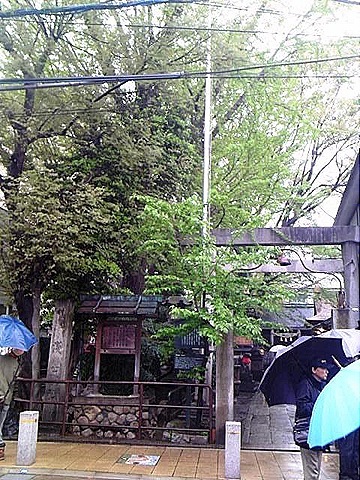 It was a small shrine named Sengen Jinja. 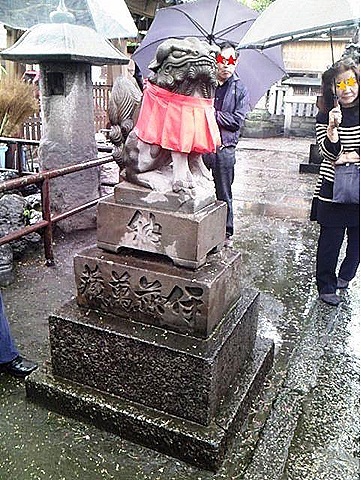 It has a pair of stone-carved guardian dog, and one of them has a man’s name engraved on the base: Manzo Ito. He was born in 1833 and died in 1927 at the age of 95. 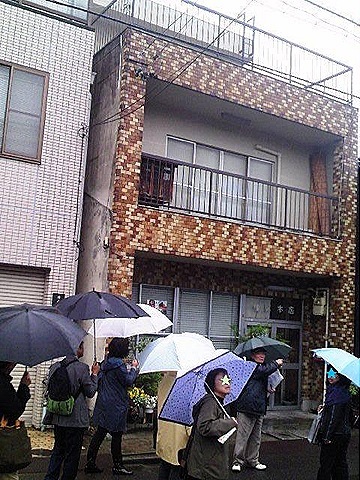 He was a quite common citizen, but you may be able to find his name all over Japan. His lifework was donating stone gates, stone guardian dogs, stone garden lanterns, and milestones and so on to shrines and temples throughout Japan. Actually no one knows how many those stone things he contributed in Japan. That is why there are many “Manzo collectors” who look for Manzo’s stone gifts and take those photos in this country. Actually I hadn’t known about him until the guide explained. I’m going to try finding his stone mementoes when I visit temples or shrines. After leaving the shrine, we went through a street called Shike-michi. 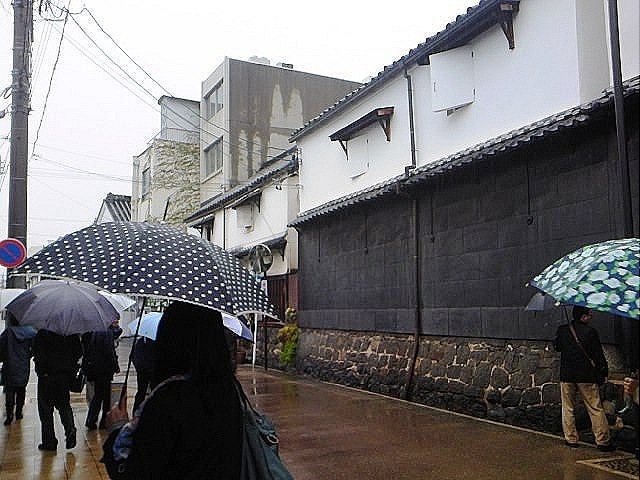 The area was rebuilt with an about 7 m wide (=shike) backstreet for prevention of fire spreading after burning down by a big fire in 1700. This area maintains the old era’s atmosphere because they were able to escape the damage of the World War II. 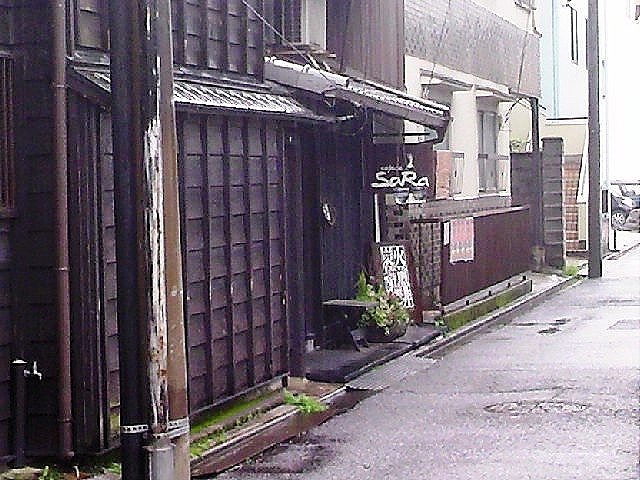 There are many old white plasters and blacken wooden buildings in the street, but many of them are now fashionable cafes, restaurants, or galleries inside. The area has very interesting things, too: Yanegami-sama. 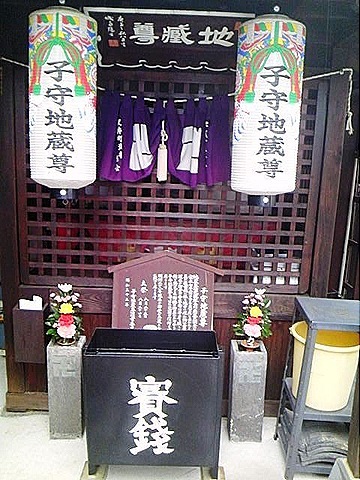 It is a shrine on the roof. 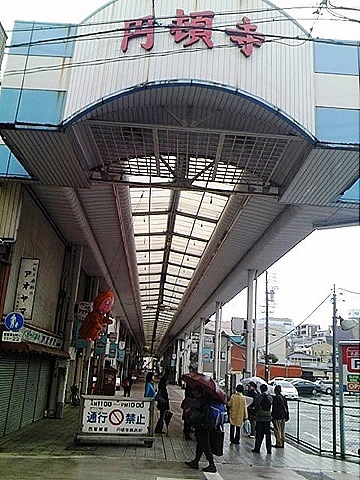 You cannot see these things everywhere in Japan. It is quite unique. 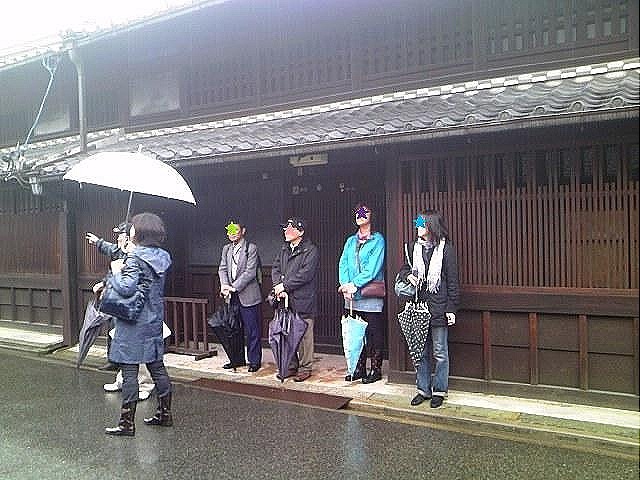 Yanegami-sama is not a possession of the family of the house, but of all of the people in the area. So if the resident of the house wanted not to keep caring the shrine, they couldn’t do anything. Tradition is strong there. We deeply understood the degree of importance of the culture when we found another Yanegami-sama in a veranda of a concrete building later. After we saw a shrine which worships a stone statute called komori-jizo, which is said to have been found in a well dug by villagers in 1858, we went to Endo-ji Shopping Mall, which used to be full with people but now is deserted unfortunately. Around the mall, there are many old temples. 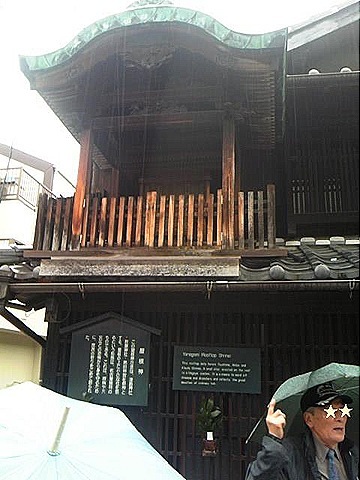 shrines, buildings, and even a few Yanegami-sama. We smelt something delicious while walking in the mall. It was just when Yuko was talking about her old memory: she had bought some potato croquets around there before. We shouted, “Croquet!” Indeed, we saw a butcher’s shop ahead. Yuko got really excited and said, “I’ll buy some croquets there! Maybe it’s the same shop!” But unfortunately our group turned the left before we got to the shop. “Go ahead! I’ll catch up with you!” Yuko said that and dashed to the shop to buy croquets. But luckily the walking tour was over with the guide’s ending speech soon. The number of the tour participants had become about 10. We thanked to the guide, said goodbye to other participants, and then found a table nearby. When we opened the parcel, the savory aroma of hot croquets rose up. Ah…croquets… When we had one bite, we noticed we were really starving and tired. But after eating, we regained energy and felt relaxing after the cruise and the walking tour. The Horikawa Cruise: "Where are we now?" "…..I don’t know!" That happened in a boat. 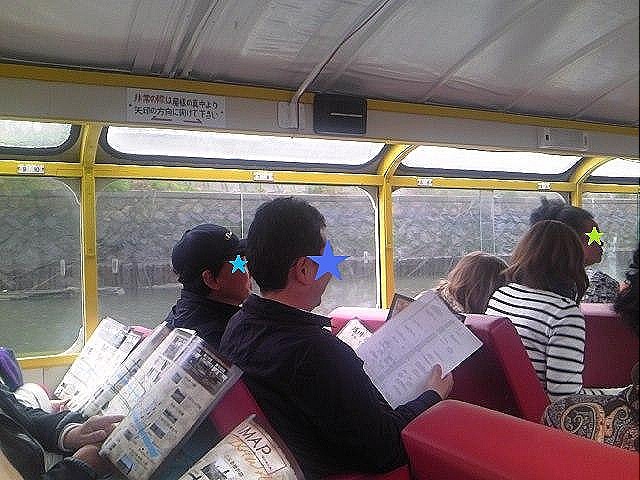 I took part in an interesting tour named “The Horikawa Cruse”. Horikawa is a man-made river in Nagoya, Aichi Prefecture. It was made for carrying building materials of Nagoya Castle to the site in 1610. It used to be clear, but it began being contaminated by human sewage in 1950’s and came to become a murky river. 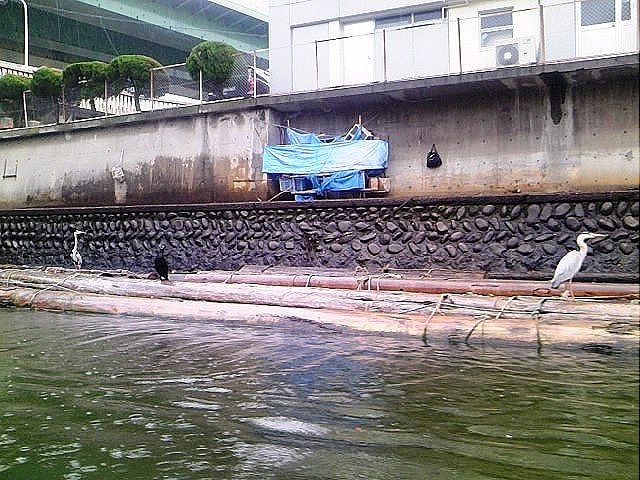 However, it has become clearer because Nagoya City has dredged periodically since 1994. 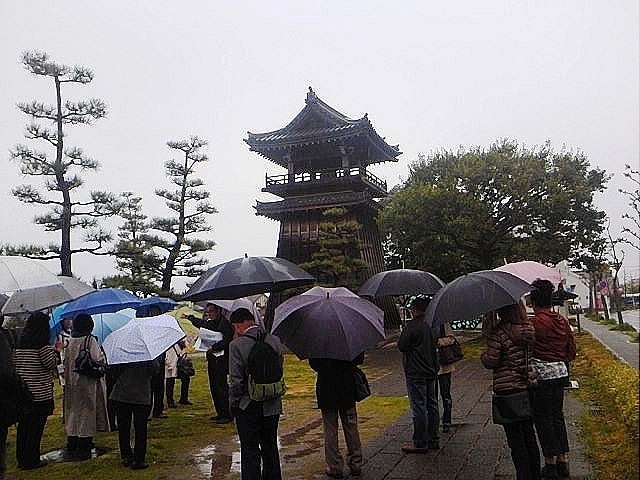 This tour was held by AGGN (Aichi Goodwill Guides Network) on April 22 for studying the Horikawa River and the town nearby to conserve them as historic things. The participants boarded at Miya-no-watashi near Atsuta Jingu Shrine. The place used to face the sea, which is far way from there now. The place was very important for travelers and merchants, and material flow more than 400 years, but now it is all gone to pot. 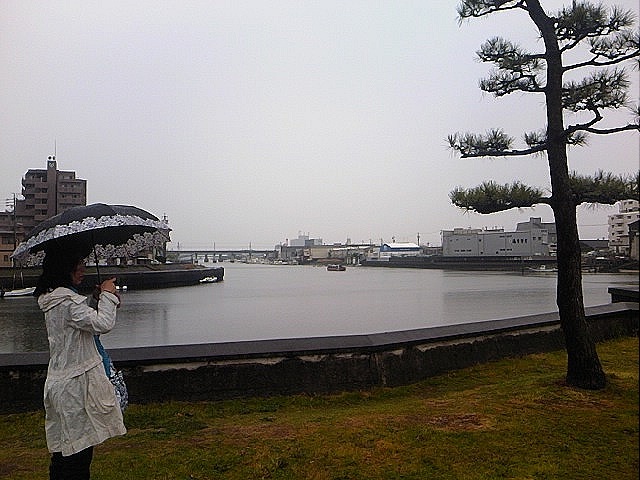 The Horikawa River is about 16 km. 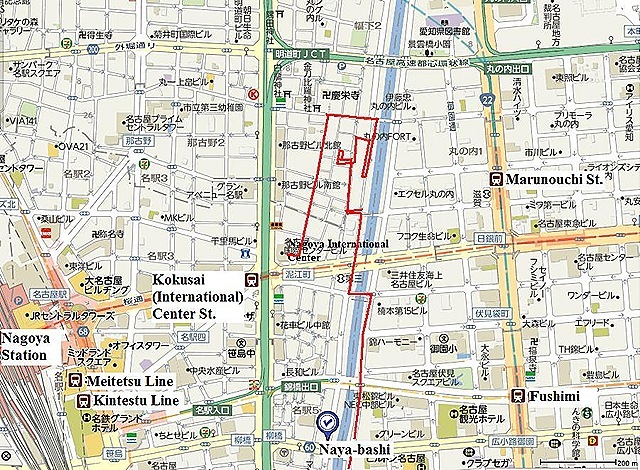 We spent an hour and a half going from Miya-no-watashi to Asahi-bashi, and then disembarked at Naya-bashi. Actually, we hardly could see almost anything during the cruise. We could not open the roof and windows because it was raining and very cold that day. 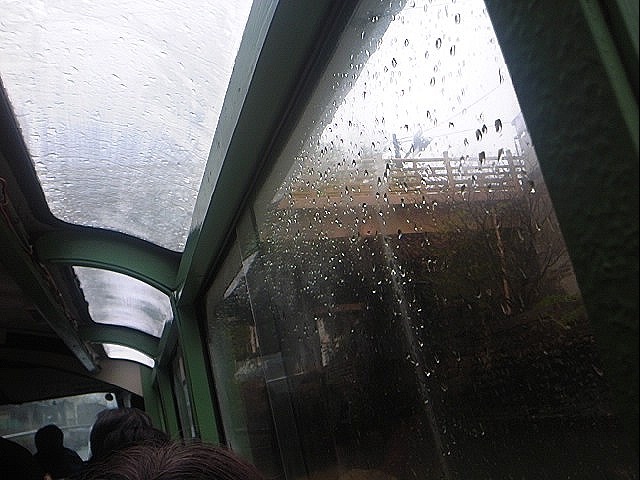 The boat was very short and its windows are small. So we saw mainly just the river banks and bridges’ columns. We shouted the joy when we saw even some water birds automatically. I wrote “it has become clearer” above, but it means that it is clearer than the worst condition. That is, it smelt like the garbage collection site in summer. We could not have a nice view, but it was nice we could not open the roof and windows. If the tour had been held on a nice and hot day, we could not have stood the stink. Oh, I have not written anything good on the tour yet! You can learn many historical things through the tour. For example, there are more than 40 bridges in the Horikawa River, and seven of them are called “Horikawa Seven Bridges” and very important: Gojo-bashi, Naka-bashi, Temma-bashi, Naya-bashi, Hioki-bashi, Furuwatari-bashi, and Oto-bashi. I am not going to explain about each bridge here this time, but each one has its own history, architectural style, and taste. We listened to the guide looking up the bridges through misty windows. 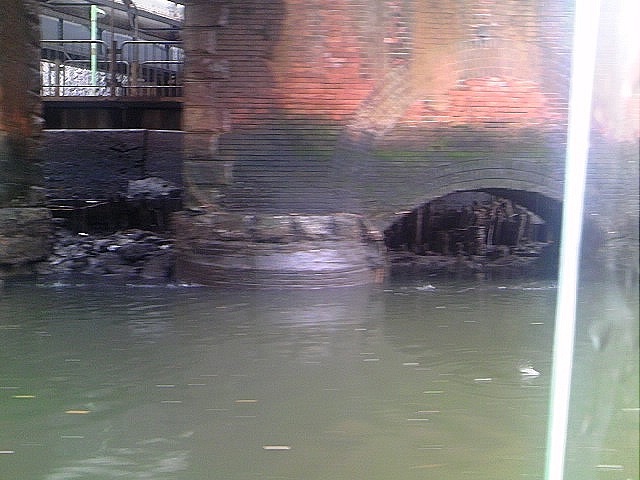 The Horikawa River is still murky and stinky, but it tells us about its history. 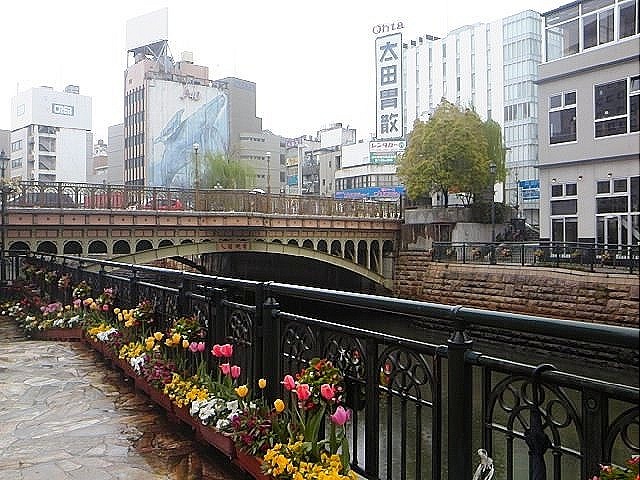 Nagoya City and its citizens are now trying to revive the river. I would like to take part in a Horikawa Cruise again someday when the weather is nicer (after the river got much clearer…) . Actually, some of the participants went on a walking tour with the same guide after we got off the boat at Naya-bashi, and it was more interesting than the cruise…I’m going to write about it next time.